[S6] G.E. Cokayne; with Vicary Gibbs, H.A. Doubleday, Geoffrey H. White, Duncan Warrand and Lord Howard de Walden, editors, The Complete Peerage of England, Scotland, Ireland, Great Britain and the United Kingdom, Extant, Extinct or Dormant, new ed., 13 volumes in 14 (1910-1959; reprint in 6 volumes, Gloucester, U.K.: Alan Sutton Publishing, 2000), volume III, page 472. Hereinafter cited as The Complete Peerage. 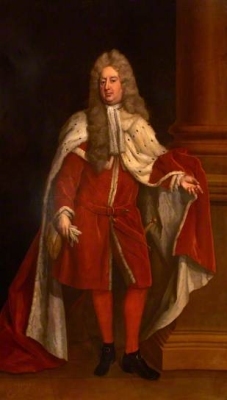 He succeeded as the 4th Viscount Deerhurst, of the hundred of Deerhurst, co. Gloucester [E., 1697] on 28 January 1711/12.1 He succeeded as the 4th Earl of Coventry [E., 1697] on 28 January 1711/12.1 He succeeded as the 7th Baron Coventry of Aylesborough, co. Worcester [E., 1628] on 28 January 1711/12.1 His last will was dated 27 October 1719. [S6] Cokayne, and others, The Complete Peerage, volume III, page 473. [S15] George Edward Cokayne, editor, The Complete Baronetage, 5 volumes (no date (c. 1900); reprint, Gloucester, U.K.: Alan Sutton Publishing, 1983), volume II, page 126. Hereinafter cited as The Complete Baronetage. Her married name became Coventry. Leila Louisa Colquitt-Craven was born circa 1844 at Ablington, Gloucestershire, EnglandG.2 She was the daughter of Goodwin Charles Colquitt-Craven.1 She married Reverend Henry William Coventry, son of Hon. William James Coventry and Mary Laing, on 21 April 1868 at Northleach, Gloucestershire, EnglandG.1 She died in 1899. From 21 April 1868, her married name became Coventry.1 Her married name became Coventry. [S5550] Lisa Davis, "re: Coventry Family," e-mail message to Darryl Roger LUNDY (101053), 13 July 2011. Hereinafter cited as "re: Coventry Family." Frances Anne Lucas is the daughter of Henry Lucas.1 She married Major Walter Frederick James Cowan in 1869. Her married name became Cowan. [S96] L. G. Pine, editor, Burke's Peerage and Baronetage, 101st edition (London, U.K.: Burke's Peerage Ltd, 1956), page 536. Hereinafter cited as Burke's Peerage, 101st ed.